What will Egypt one day look like? Declaring this future, and drawing it visually, is one way to secure authority. 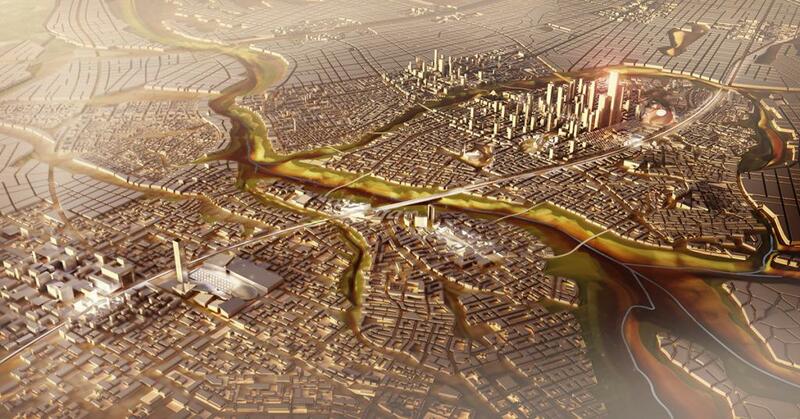 This is a view put forward by Mada Masr, discussing the plans for the new Egyptian capital to replace Cairo. The presentation thus stands not only for a city, but for a whole world — and not merely a better or a greener world, but also a world that is ultra-organized, a world where everything on both the macro- and micro-scale follows a single abstract plan that blatantly encompasses everything. During the presentation, however, very little was said about the viability of this world. Questions of whether it’s financially feasible, or whether it’s actually going to be functional, or even liked by those who are going to inhabit it, were not addressed. There were only speculative abstract graphics, but they were enough to convince the audience of the achievability of this imaginary world, give it a material existence, and make it somehow immediately graspable. The maps and images had such a potent make-believe effect that the value of properties located within several dozen kilometers of the proposed city spiked out of proportion just a few minutes after the press release was issued. The article goes on to show a similar promotional effort in the 1970s to create Sadat City. Between Cairo and Alexandria, at the time it was also designed to be a new administrative capital. Sadat City exists, but in pale reality to the original promise. Mada Masr is worried the new capital city project is more of the same. The government’s growing interest photoshopped maps, architectural visualizations, video promos and professional presentations might simply be good PR campaigning, but it’s also part of a ruling paradigm. These plans, drawings, maps, images, videos, presentations and other visual media about grand schemes for a new Egypt are in fact some of the ways in which the authority produces itself, rather than being a mere product of the regime. If so, the same effort to inspire and hold morale is witnessed in the Muslim Brotherhood. Here, the visual future is in the form of a grand museum to honor the hundreds killed while dispersing the pro-Morsi sit-in at Rabaa al-Adawiya mosque in Cairo. The Rabaa Story website is sleek and glossy, with infographics detailing the number of people who died during the dispersal (though without clearly identifying sources), pictures of victims, videos promoting the second year anniversary and blurbs telling people to mobilize “on the street” and make videos promoting awareness of the anniversary, and even plans for a museum. But both the website and the Ikhwanweb twitter account appear to be reaching out and appealing to an international audience. Almost all the promotional material is in English, even the hashtag representing the campaign, and none of the promotional material is religious in nature — instead, it focuses on human rights violations. When it comes to how the public side of the Muslim Brotherhood remembers Rabaa, the focus appears to be on getting the notice of the international English-speaking community — a community which, as shown by recent condemnatory statements from foreign rights groups, has already proven sympathetic to their narrative. Image projection is powerful. Mada Masr finds that both sides in the standoff realize this, and are — in these examples — appealing to the hopes of a core constituency.